Designing gardens in Hitchin, Hertfordshire means I am always experimenting with new plants. All designers love those that have strong shape and colour and fall under the ‘architectural’ heading. A couple of years ago I stumbled across some Angelica Gigas plants being sold on a market stall in St Albans. It was a new name to me and so I bought a couple of plants to put in my own garden. I read that they like moist soil and a fair amount of sun and planted them accordingly at the back of one of my borders. I knew this plant was a biennial, meaning it would only flower in it’s second year so was prepared to be patient. Last summer I watched as the plant grew to it’s impressive height of around 1.5 metres on strong self supporting stems. Then in August the strange shaped buds opened to reveal a stunning deep red, domed shaped flowerhead. As a late summer flower, this plant ‘stole the show’ in my garden with both it’s colour and shape. Not only did I love it but it proved to be a huge hit with the insects too! I have saved the seed heads hoping to grow some more myself, but have read that this variety is tricky to germinate. Plan B will be to buy some new plants and let them self seed to ensure they stay a permanent feature in my garden. 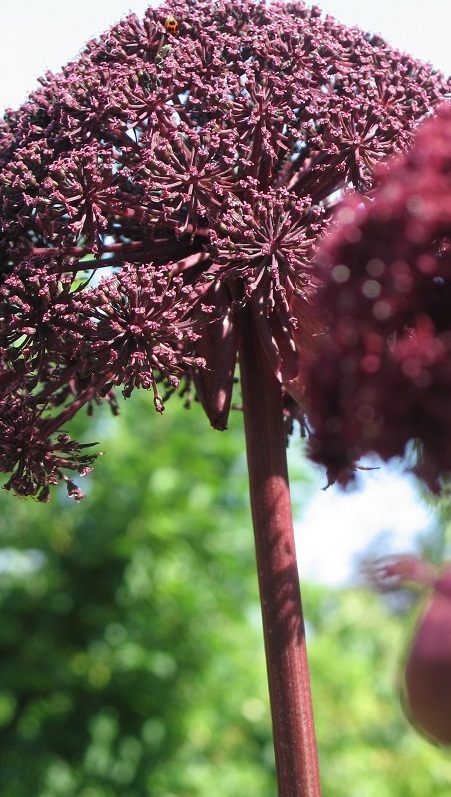 If you want to buy Angelica Gigas seeds or plants for your own garden click here. 19 Bessemer Close, Hitchin, Hertfordshire, SG5 1AG.